Hartley Grace Featherstone is having a very bad day. First she finds out that her boyfriend is cheating on her with the president of the Herbert Hoover High School Chastity Club. Then he's pegged as the #1 suspect in a murder. And if that weren't enough, now he's depending on Hartley to clear his name. Seriously? Not cool. But as much as Hartley wouldn't mind seeing him squirm, she knows he's innocent, and she's the only one who can help him. Along with her best friend, Sam, and the school's resident Bad Boy, Chase, Hartley starts investigating on her own. But as the dead bodies begin to pile up, the mystery deepens, the suspects multiply, and Hartley begins to fear that she may be the killer's next victim. Deadly Cool is a murder mystery with delightfully hilarious characters and a twisting plot. When it starts out, Hartley has just busted into her boyfriend's locker, and found something that's proof positive to the fact that he's a lying, cheating jerk. And with the president of the Chastity Club, no less! When she goes to confront Josh, she finds a dead body instead... Unfortunately, that's not the only dead body Hartley will find. Now her boyfriend--ex-boyfriend-- is a wanted suspect and on the run, Hartley is the hottest topic at school, known as the chick who keeps finding dead people, and she's determined the find the real killer... Except she may die before she finds out. This book is much funnier than I thought it would be from the summary. There had to be at least 5 times that I started chuckling out loud from the hilarity of Hartley and her best friend Sam, and even Chase, despite his Bad Boy-ness. The way Gemma wrote the dialogue and Hartley's thoughts was seriously comedy gold. Even from the first few sentences it's funny! "There are three things you never want to find in your boyfriend's locker: a sweaty jockstrap, a D minus on last week's history test, and an empty condom wrapper. Lucky me, I'd hit the trifecta." There wasn't one character in this book that I didn't like. Hartley was cool and very relatable. It amazed me that she was able to keep her head under the pressure of a murderer who is obviously pin pointing her. But she stuck to her promise to Josh to find out who the killer is. Sam is the funny best friend, always there to crack a good joke, I loved Sam's humor. And then there's Chase, a senior that gets caught up in the girls' investigation. He's got that dry humor that made me smirk almost every time he said something. Plus, I totally dig the Bad Boy. :) I loved how he was a part of the story from the very beginning, but his role grew substantially as it went on. Gemma's writing was really fluid and the tone realistically teenaged, which I think contributed to why I related well with Hartley. It was fast-paced and not overly wordy--I finished the book in just a few hours! Fast reads are the best. The plot wasn't entirely original (how many 80s high school slasher flicks are there? ), but it was executed pretty well. I was wondering the entire time who the killer was, going back and forth between suspects just as Hartley did. And in the end, when it was revealed, for me it was an "AHA!" moment. I really didn't see it coming. I was also glad that it didn't just end off after finding out who the killer was. We got a little extra story that tied it all together, but at the same time left some things open to interpretation. 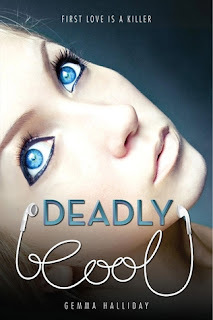 Deadly Cool was a welcome change from all the paranormal and fantasy I've been reading, and a great one at that. Definitely recommended if you're looking for something relatively quick, with great characters and a fun mystery to solve. I give this 5 out of 5 stars.